Remember when LG announced that the LG G Pro 2 would be making its debut this month and everyone figured that that meant it would show its massive face at MWC? Apparently that rather reasonable assumption was way off and we're set to see it a lot sooner, February 13 in fact. An invitation posted by ZDNet shows an event this Thursday between 10:30am and 1pm in Seoul prefaced with the line "Knock-knock knockin' on", a reference the knock-on feature that originally graced the LG G2. 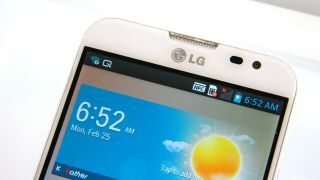 A pre-MWC launch would certainly guarantee LG's latest flagship more attention than getting lost amidst the MWC noise. It would also give the G Pro 2 an 11-day head start over its Korean rival the Galaxy S5. Little snippets of information, including the 13MP camera with "OIS plus" technology, Ultra HD video recording and a 1W speaker, have already got us salivating over a handset expected to sport a 6-inch screen. Whether the LG G Pro 2 decides to step into the limelight on Thursday or at MWC 2014 you can guarantee that we're going to bring you all the latest gossip so don't go anywhere.